For those special occasions when something decadent and inviting is worth waking up early or staying up late for, consider our Cinnamon Swirl for the ideal sweet indulgence. Rich with cinnamon, the swirled bread is baked with only the best ingredients, like clarified butter, applesauce and walnuts. Then it's rolled up into a deliciously moist and scrumptious log, with all the deliciously gooey ingredients inside. 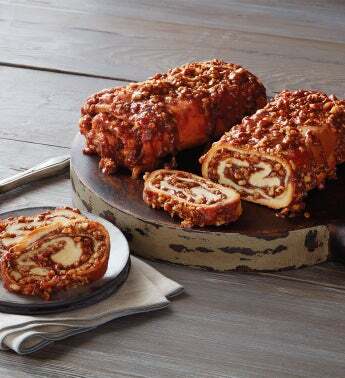 A sweet gourmet treat is a breeze since the Cinnamon Swirl arrives already cooked and ready to eat. Enjoy it served at room temperature, or gently warmed in a microwave. Quick, flavorful and impressive. Rumor has it this jaw-dropper is addictive served warm with butter, cream cheese or ice cream and finished with a side of fresh fruit.